THE SCRAP-IRON FLOTILLA Pt. 2. Off the Egyptian coast, almost within sight of Alexandria, four Australian destroyers prowled through the calm, dark night. In the messdecks the watch below played cards and Uckers, and wrote letters just as they had always done at sea; but somehow everything was different. A few stokers (who must rank with the world's most enthusiastic poker-players!) shuffled cards listlessly, and on the seamen's mess-deck even a double six couldn't raise the Uckers game from the doldrums. The wireless blared raucous music. But in a few minutes that would stop and then they would hear the news. It was 11 p.m. on 10 June 1940. Australia was at war with Italy. Official news had come earlier from Admiralty, but that had been a cipher, seen only by the officers. The messdeck wireless was for every one-it was the focal point of every rating's attention, and games and letters were but to while away the time until the official bulletin was broadcast. On deck, men huddled closer round their guns, look-outs kept watch with new eagerness. There was a chance of action now. 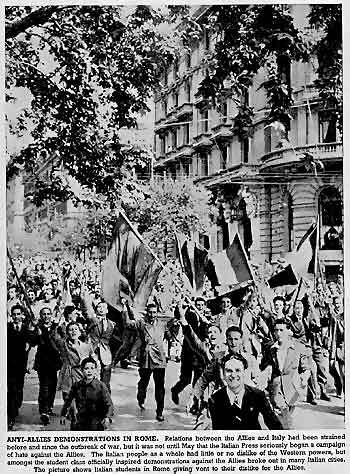 Anti-British demonstrations had reached their climax in Italy and black-shirted Fascisti had cheered their Duce as he thumped his fists on the railing of the Palazzo Venezia's balcony and bellowed: "Our destiny has arrived." The writing was clear. In Alexandria itself the "buzz" had been strong even before the destroyers sailed. "Gyppo" hawkers, whose amazing grapevine of information had spread its tendrils into the most secret places, confidently told the Australians that Italy would declare war in a matter of hours. Now, as they patrolled off the coast, officers and men felt something of the tingling thrill of expected battle. Rear-Admiral Tovey had promised that they would have a go at the enemy when the chance came. And now, at last, that chance had come. Wireless speakers throughout the ships blared the news of Italy's entry into the war. On the mess-decks the poker-players were still. Uckers dice lay discarded on the cloth. Half-finished letters were tossed aside. The news ended and cheers rang throughout the mess-decks. In his new-found enthusiasm a stoker opened a jackpot with a pair of sevens. The look-outs above kept closer, grimmer watch. It was good to have a real "war of their own", but Britain faced many serious problems in the Middle Sea. There was a powerful base at Gibraltar, at the western end of the Mediterranean, but the next base, Malta, lay a thousand miles to the eastward and Alexandria was eight hundred miles farther on. The maintenance of sea communication between these three bases was of fundamental importance, and depended not only on command of the sea, but also (though to a lesser degree) on aerial superiority. Italy had every chance to dispute these. Her bases in the Southern Italy, Sicily, Pantellaria and Tripoli virtually divided Mediterranean into two, and should have been a barrier to the passage of convoys and units of the Fleet from Gibraltar to the ports of Egypt, Malta and Palestine. Mussolini announced immediately after declaring war that the narrow channel between Sicily and the African coast had been mined. He had strong bases at Palermo, Messina and Augusta in Sicily, Cagliari in Sardinia and at Tripoli on the North African coast. Much of Italian naval strategy was based on the geographical position of these ports in relation to the remainder of the Mediterranean and it is not surprising to find that their ships were built with more emphasis on speed than on armour. Fast light cruisers, destroyers, motor torpedo boats and submarines could prove particularly destructive in harrying convoys in the narrow straits so convenient to Italy's bases. It was on these craft that Mussolini (pictured left) staked Italy's future in the Middle Sea, for the major problem for both Italy and Britain was that of sea-borne supplies. Italy had at her disposal more than sixty fast destroyers of a thousand tons and over-modern ships indeed compared with the ancient "V" and "W"' class! In addition to these were the torpedo boats, whose tonnage ranged from two hundred to nine hundred and of which Italy probably had nearly one hundred. Then there were the vaunted M.A.S. (or motoscafi antisommergibili) which later proved so vulnerable to almost any type of fire. And finally there was the formidable submarine fleet (much larger, incidentally, than that of Germany). Its potential menace, though, was much greater than its actual accomplishments. There were, of course, the larger ships-battleships both old and new, and some really first-class heavy cruisers. But these were more for use outside the restricted waters of the straits. On the other hand, the Royal Navy could spare only part of its forces for the new war in the Mediterranean. The U-boat menace in the Atlantic necessitated close guard on all convoys and the movement of large surface raiders kept the bigger ships engaged. 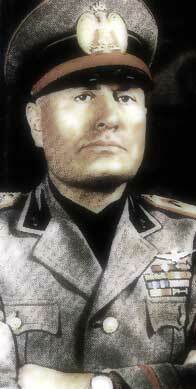 When Mussolini declared war, the Allies' naval strength in the Mediterranean was stronger than it had ever been. But within a month, the French collapse, with the consequent loss to Britain of the services in the Middle Sea of nine battleships, eighteen cruisers, sixty destroyers and about forty submarines, gave Italy undoubted superiority. No longer were the French bases available to the British ships, whilst Italy was faced with no great distances between ports, docks or fuel supplies. That was the problem facing Commander-in-Chief, Mediterranean Fleet, Admiral Sir Andrew Browne Cunningham, K.C.B., D.S.O. And his solution can be summed up in this one word: "Attack". He refused to admit that superiority in tonnage and numbers of ships meant victory, and his strategy was to strike at the Italian Fleet whenever and wherever possible, even if it meant fighting almost at the entrance to Italy's own fortified ports.So with a new war to fight, Stuart, Vampire, Voyager and Waterhen were among the British ships which prowled off the coast looking for action. But Vendetta was not on patrol that night. Stripped by dockyard "maties", she lay in dock at Malta almost in the middle of her badly needed rest. Members of the crew, who heard the news of Italy's declaration as they clustered round the wireless at the Ricasoli rifle range, raced back to the ship, began loading belts for machine guns, and emergency parties were detailed. Then, dressed in their oldest clothes, officers and men collected their steel helmets, respirators and what­ever arms they could find, and lay in heaps among the debris in the dockyard awaiting the inevitable call to action. 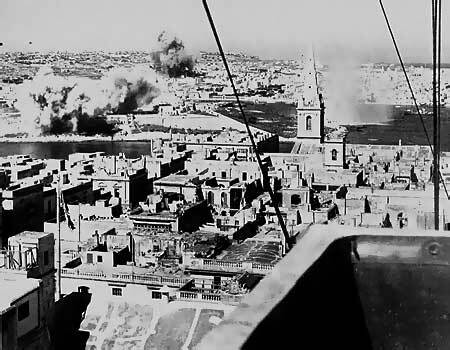 At dawn, Malta's powerful sirens wailed their melancholy warning and a few minutes later Malta's first air raid began. Running along the deck to their guns the Australians heard for the first time the roar of hostile aircraft, saw tiny spurts of dust rise along the dockside, and knew, vaguely, that they were under fire. Then the first bombs fell, great yellow bombs that seemed to float down from the fleeting planes which were already zooming up to join the less daring machines above them. A few hundreds of yards from the dockside the bombs exploded. There were six roaring detonations, each merging into the other, and shattered fragments of rock were hurled into the air to shower like falling hail. A huge column of smoke and finely ground dust mushroomed into the sky and the planes were hidden from Vendetta's gunners who had poured rapid but hopeless bursts of fire at their first enemy target. In a huge tunnel not far away the Australians saw doctors working on a number of wounded civilians, but deaths had been few and there were no naval casualties. Vendetta's crew were detailed to assist the Army and many of them set off in motor lorries to guard wireless stations and other important positions. Malta expected parachutists, for it was believed that the bombing was but a prelude to an attempted air-borne invasion. Gun crews waited grimly by their guns in pits hewn from the solid rock; the Maltese (whose hatred of the Italians is almost as great as their patriotism and faith) waited with their sharp, wicked-looking knives. The paratroops did not arrive. From the airfield three British fighters took off to engage the enemy bombers. It seemed a hopeless mission, for they were old and slow antiquated biplane Gladiators that had been hurriedly assembled by eager ground crews. But they were flown by pilots whose courage and skill somewhat offset the machines' deficiencies, and an Italian bomber was shot down within a few minutes. The quick "kill" was announced over the dockyard loudspeaker system, and Maltese workmen, oblivious of the bombers which still flew overhead looking for targets, stood to attention and sang 'God save the King" with soul-stirring fervour. The Australians joined in, then burst into cheering as the Italians left and the three old Gladiators circled round the airfield and landed. The planes were christened "Faith" "Hope" and there were too many pilots to man three machines and every time the aircraft warning sounded there was a race for the honour of taking the "old crates" up. For some weeks Vendetta lay helpless in dock, with workmen racing to complete the refit. Her crew, resembling dervishes, wore ammunition belts, pouches and bayonets, carried almost every type of weapon. Dusty, weary, they were scattered in strong-points throughout the island, with no thought of leave. Vice-Admiral Malta in a message to Vendetta's captain, Lieutenant-Commander B. Rhoades (later D.S.C.) spoke highly of the work the officers and ship's company had done in improving the defences of the island. "They have produced astonishing results, and in true Australian fashion, have turned their hands to everything," he said. Stuart was to be the first to go to action stations. On the morning of 11 June, less than twenty-four hours after Italy declared war, an excited look-out at the mast-head screamed down the voice-pipe: "Ships on the horizon bearing green three-oh." Alarm gongs shrilled throughout the ship. They had only been used for exercise before, so the cry: "Dinkum, dinkum, dinkum", went round from stem to stern, from wardroom to messdeck. Seamen on watch below swept away pens and writing pads, threw down packs of cards, stuck needles hurriedly in suits being "tiddlied" for a shore run, raced to their action stations. Magazine doors swung open, and eager supply parties waited to feed hungry guns. Fire and repair parties gathered, ready with their kits to patch up any damage caused by enemy fire. The sick bay was cleared, dressings and bandages laid out ready for instant use. On the bridge Captain WaIler peered through powerful glasses. "Four of them, sir, murmured his Gunnery Officer, Lieutenant-Commander Robison (later D.S.C.). Four of them there were, and they looked like warships. Shipping information ciphers were scanned again, but there were no British ships reported in the vicinity. Four against one is good odds, and, as Stuart shuddered forward at Lull speed, her guns were already trained on the targets. The distance lessened. A cruiser and three destroyers, they seemed to be, the cruiser leading, and the destroyers strung out in line astern. Glasses were trained as officers and men tried to identify the four ships. Then, as they drew nearer, Captain Waller and the others on the bridge began to laugh. The four "warships" were the tug Respond and three barges she was towing from Malta! "Secure from action stations," was piped round the ship. Cards and writing materials appeared again. And almost every letter continued: "We have just been at action stations. Thought it was four Wops, but our luck was out again." The peace of the Mediterranean was to be broken abruptly for them next day, however. Just about dusk on 12 June, a moored mine was sighted a few feet from the ship's bows. Main engines were stopped immediately, but more mines were seen nearby bobbing about in the slight swell, black spheres covered with wicked-looking spikes. Moving slowly, feeling every inch of her way, Stuart edged out of the field. It seemed as if she must be blown to pieces, as the mines swayed across to her in the swell, bobbed hesitantly for a second, then swayed away again. Amidships, seamen took out handkerchiefs to wipe foreheads suddenly beaded with sweat in spite of the coolness of the evening. The mines had been laid in a pattern, though, and Captain Waller (pictured below) decided that they had been laid by a submarine. The limits of the field were carefully buoyed to warn other British ships, and Stuart set off after the minelaying U-boat. It was getting dark now and no one relished the job. Then, suddenly, six miles farther on, a second field was found and Stuart repeated her edging tactics. Escape was more difficult this time, for the black shapes were hardly discernible in the dark, ruffled water. Three miles farther on another group surrounded the ship, bobbing up and down, inches, it seemed, from the sides. All hands who could be spared were ordered amidships, for Captain WaIler (pictured left) declared that if he struck a mine he would see to it that his bows or stern took the blow. Nerves, frayed by two previous attempts to dodge the deadly mines, neared breaking point. Stuart moved forward, stopped, went astern. In the white wake black balls bobbed slowly, menacingly. Somehow they got clear. At dawn the flotilla leader was back again at the buoyed field. Rifles were levelled at the mines which had threatened them not so long before and there were cheers as each one exploded or sank. Ships had to go in and out through the minefield, however, and Stuart led them - a slow, nerve-racking business, when any minute could bring the end. Then, in the afternoon, the crew saw the tiny minesweepers approaching. Signals flashed their bridge to the sweepers, and Stuart turned away from the field. There were sighs of relief; the tension lapsed like a pricked bubble. But there were chilly sensations in many a spine when the sweepers began to bring up and explode mines. It might have been them. Meanwhile the other Australian ships, on patrol nearby, had not been idle. Lieutenant-Commander Morrow (later Commander Morrow, D.S.O. ), in Voyager, was also on the trail of the minelaying submarine and, though the U-boat dodged behind its own minefields, it could not shake him off. The chase went on until dark. Voyager knew there was a submarine about, but didn't know where. The submarine knew it was being chased, but couldn't get far away from its pursuer. Relentlessly Voyager searched. it was a clear night and from stem to stern look-outs kept watch. This was one U-boat that wouldn't get away! 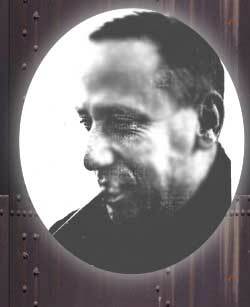 On the bridge, Lieutenant-Commander Morrow and the anti-submarine officer watched, eagerly, expectantly. On the quarterdeck young torpedo-men fondled depth charges which had been primed and set at the beginning of the hunt. They had never used them against a submarine before. But this was a good time to begin. Then the submarine was detected. Lieutenant-Commander Morrow snapped brief helm orders, Voyager swung round, and the chase was really on. On the quarterdecks depth-charge buzzers sounded the "Stand by". At his control position on the bridge, Lieutenant Cook brought Voyager's main armament ready for instant action, trained the guns on the submarine's bearing. At almost twenty knots, Voyager raced towards the submarine, passed over it. The buzzers sounded and depth charges rolled slowly out of the traps, splashing slightly in the madly churning wake. Seconds later there were muffled thuds as the charges exploded. Giant geysers shot up astern and Voyager shuddered as she took the shock of the explosion. Doubling back in her tracks like an angry terrier, the old destroyer darted in for a second attack. Depth-charge crews, working feverishly to reload their traps and throwers, seemed barely to have completed their job before the buzzers sounded again. Once more the charges rolled from the stern, were flung from throwers. Once again there were the explosions, the shock. Then they were turning again, a foaming bow wave almost cresting the fo'c'sle. For a third time the charges were launched. They exploded and there was a cheer from astern. There in the darkness a giant black shape broke surface awkwardly. The submarine had been crippled. For less than a minute she lay there on her side. But a minute was enough. 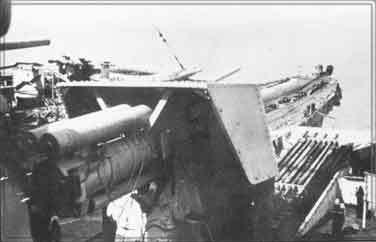 Voyager's gun crews, their keenness whetted by the brief action, brought their 4-inch guns to bear, and split seconds after the submarine appeared a salvo tore into her hull. its sides battered and ripped by the depth charges, the U-boat shuddered under the impact, lurched over and disappeared. Italy had been in the war three days, and had lost her first submarine. H.M.A.S. Voyager had destroyed the first Italian U-boat of the war. Excitement ran high throughout the ship. The anti­submarine personnel were thrilled with their victory. Gun crews laughed and joked as they thought of the destruction of the submarine with a single salvo. The depth-charge party had used their "ash cans", and were more than satisfied with the result. Yes, the night of 13 June had been more than satisfactory. But one submarine was not enough. Stuart, attracted by the gunfire and depth-charge explosions, was racing up to assist. Again she had to stop, surrounded by the last field that submarine would ever lay. For two tortuous hours, in darkness broken only by the dim moonlight, she dodged between mines. It seemed more difficult this time than it had been before. The crew, closed up at action stations, waited tensely for the explosion that they thought must come. But Stuart dodged round the last mine, safe, and still looking for action.Then, at 3.14 a.m. on 14 June Voyager had another success. Her "Kipper" submarine-detector, lean, brown Leading Seaman George Cooper, had discovered another submarine. Voyager prepared to attack again, but she had no more charges left. The submarine's position was flashed to Stuart, the tiny blue-glassed box lamp winking out its message with amazing speed across the dark water. Captain Waller, a signals officer himself, read the message even before the yeoman, gave his orders, and Stuart raced in to the attack. But the flotilla leader was not lucky enough to blow the U-boat to the surface. Captain Wailer made attack after attack, dropping charges each time he raced over the submarine's position. The last charge exploded astern. Then the black waters of the Mediterranean shimmered calmly, ruffled only by a slight breeze, Stuart resumed her patrol. In the morning a marked patch of oil was seen over the submarine's position. At noon, Vampire signalled that she had discovered another oil patch, thick and unbroken, in the same position. It was two and a half miles long. The second U-boat had been shattered.Patrol work was to play an important part in the Aus­tralian destroyers' routine, but it was not long before the monotony was broken for Stuart. On 20 June she left Alexandria to screen the force which was to give Bardia its baptism of fire-thundering broad­sides from a French battleship, British and Australian cruisers and cheeky destroyers. On the destroyer screen with Stuart were Dainty, Decoy, and Hasty. Sydney, who was to get her first taste of action, accompanied Orion and Neptune. The French battleship Lorraine ploughed powerfully in their wake on her first and last mission in the war against Italy. Muffled slightly against the chilly air, the men in Stuart watched eagerly for the Libyan coast. The first yellow streaks of dawn flickered dimly on the white barracks which sat solid and prominent on the dark escarpment. The destroyers felt their way closer inshore, Captain Wailer listening attentively to reports from leadsmen in the chains. Charts of this coast were not very reliable and the enemy were but a mile or two away. Neptune opened the battle just before 6 am., a screaming salvo of shells plummeting into Bardia. Stuart fired a round from "B" gun. The gunnery officer observed its fall near the tall wireless mast and a broadside followed. Lorraine was steaming slowly up and down the coast, her 13.4-inch guns belching flame and black and yellow smoke. Sydney, Neptune and Orion poured broadside after broad­side into the town. The destroyer's tiny guns snapped vicious salvos. And the guns of sleeping Bardia made no reply! Shell after shell burst in the target area and Stuart fired three more salvos into the area allocated to her before a thick pall of smoke rose from the town, mingled with the fine brown dust, and provided an impenetrable screen. The barracks, town and harbour were hidden and smoke and dust drifted slowly out to sea, eddying and swirling slowly in the breeze. At five past six the bombardment ceased. Stuart had fired forty rounds of. high explosive into Bardia and months later when, after Wavell's victorious advance, members of the crew walked through the town they picked up pieces of the shells near the twisted wreckage of the radio mast. Stuart had been the only ship firing 4.7-inch high explosives. It had been fun! They had raced in unseen, flung shells into the Italian stronghold and departed as silently as they had come, unharmed and without casualty. Bardia, one of the strongest of all Mussolini's fortified towns, had not fired a shot during the entire bombardment. Taken by surprise, the battery crews had fled, abandoning their guns in what was later recognized as true Italian fashion. Back on patrol, Vampire had rapidly caught up with Stuart and Voyager as a submarine-hunter. Within a week she had claimed two. In three attacks she dropped eighteen charges on the first, shattering its hull. So heavy were the explosions that some of Vampire's electric light globes were smashed. Next night Vampire was in the middle of a minefield, and for an hour skirted round the "black bastards", as the crew called them. Then they were safely out of the field, but seconds latex a look-out reported a mine right ahead. Commander Walsh ordered: "Hard a'starboard," and Vampire swung round. The look-out watched as the mine wallowed in the swell scant feet from the sides. Then, in the darkness he saw that it was a buoy. It tapped lightly on the stern as Vampire swung away. A week later Vampire again contacted a submarine, and raced in to the attack. The submarine went deep after the first pattern, but surfaced suddenly when blasted by another charge. Commander Walsh headed Vampire directly for the black hull, but the U-boat crash-dived, only to have a full pattern explode around him. Voyager picked up thirty-eight prisoners from one of her U-boat victims-thirty eight Italians, terrified as a result of the blasting of depth charges. They had been told that the English killed without mercy, and took no prisoners. They suspected the Australians when they took them into the mess and gave them food. These were not the British surely-the British Mussolini had told them about? Most of the crew were under twenty-one. A number had only left high school a month before. They had had no training, were totally unprepared for the terrible undersea war in which they were involved. In Malta, Vendetta was nearing the end of her refit, and her ship's company weren't sorry. A curfew was imposed and sentries fired after one challenge. The Maltese, intensely patriotic and bitterly hating any one who even indirectly aided the despised Italians, saw that the curfew was strictly adhered to. But before the end of June the island suffered its first real loss. One of the three gallant Gladiators was shot down in combat. The ancient trio had fought battle after battle against impossible odds, but somehow they always managed to return. There were often bullet holes in the fuselage. Sometimes they had been damaged more seriously, but they had always come back to be patched up ready for the next encounter. And now one of them had "had it". By unanimous consent it was "Charity" that was lost -"Faith" and "Hope" remained. By the end of June night raids were becoming more popular and often the inquisitive silver-blue lances of the searchlights would pick out a plane. Then the bombs could be seen, too - glistening specks that fell with a fearful shriek and burst with an angry roar on the rock-clad fortress. Siren-fitted bombs were a problem at first, for they seemed more menacing than those which fell with a faint "swish"; but when the Maltese saw that they did no more damage than any other bomb, work was no longer interrupted. Soon the Hurricanes arrived. At first there was just the "buzz" that "Faith" and "Hope" had been reinforced, but then the darting, dashing new fighters were seen, and two Savoia bombers toppled out of the fight in flames. Cheering Maltese stood at the entrance to their deep shelters, tears of gratitude welling from their eyes. Britain was hitting back -faith and hope, literally, were not so important as they had been. The Hurricanes brought their own problem, however, and caused the first "paratroop alarm". In one particularly large raid they shot down so many planes in such a short time that the sky seemed to be full of parachutes. Vendetta's crew, in common with the others on the island, believed that the threatened invasion had really begun. In a few moments the island bristled with weapons. Troops appeared as if by magic from a score of innocent looking positions, and their machine guns covered the long lines of concertina barbed-wire. But when the Italian machines fled, with the Hurricanes close on their heels, it was obvious that the "paratroops" were only air crews whose planes lay mangled and burning throughout the island. And far behind the Italians and the Hurricanes flew "Faith" and "Hope"- still eager to fight. Faith is no small thing in the life of the Maltese. Every house, every bus, every church has a crucifix. Statues of the Virgin Mary can be seen on street corners and even in the long tunnels that are now air-mid shelters. There was one shelter just outside the dockyard gates which was not hewn from Malta's rocky face-a flimsy construction in which some fifty wives of dockyard workmen occasionally sheltered. Outside the shelter was a little statue of the Virgin, a handful of withered flowers at her feet. One day late in June a large yellow bomb landed almost at the statue's feet. Inside the shelter, on their knees, were women and children. The bomb made a large hole in the street, pieces of the casing showered over the statue and the inside of the bomb was strewn right to the entrance of the shelter, But there was no explosion. The women left their children inside the rough shelter, and carried what was left of the two hundred and fifty pound bomb to the water's edge. Faith means something in Malta. So ended June and the first month of the war with Italy. On the Australian's scoreboard, chalked up boldly for all to read, was an impressive tally for 21 days work. The only casualty was Vampire's cat. He fell down a hatch into the engine room and broke his back. They buried him at sea with the appropriate ceremony. At the other end of The Med, France had just asked for an armistice with Germany.